In order to make this Batman picture cake, start with baking a sheet cake of the size that you will need. Ice the cake in buttercream icing. Next, use red food coloring spray and spray the cake lightly. Then take green food coloring spray and spray the shape of a bat filling in the shape of the bat completely. Next, take the red spray again and spray over everything once more making sure you cover the green bat completely. The bat will turn dark and look like a shadow. Let it dry a few minutes before proceeding. 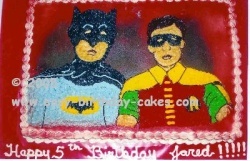 Using an icing filled bag and round tip, size #5, draw Batman and Robin on the cake according to the picture above. Make a flesh colored icing. I use a very small amount of red and yellow coloring to achieve this. First, fill in the skin areas using the flesh colored icing and star tip, size #18. Next fill in the black icing areas using the same star tip, size #18. Fill in Batman’s head and shoulders, the bat on his chest, Robin’s mask and round circle. Robin’s hair is done with dark brown icing and star tip, size #18. Make yellow icing and using the same star tip, size #18, fill in robin’s cape, the R on Robin’s chest and the background around the bat on Batman’s chest. Make green icing and do Robin’s sleeves using the same star tip, size #18. Then fill in Robin’s vest with red icing using the same size star tip. Make a light blue gray icing for Batman using a very small amount of blue and black. Remember if you get it too dark just add more icing and it will lighten. Fill in Batman using blue gray icing and the same size star tip. Change the tip to round tip, size #5 and do the outline work on the black part of Batman. Refer to the picture. Next, use dark brown icing and round tip, size #5 and outline Robin referring to the picture. Then use yellow icing and star top, size #18 and make short lines for the laces on Robin’s vest. Use white icing and star tip, size #18, make the shell border around the edge of the cake. I lightly sprayed the border red to blend it in more. Finally make the same shell border at the base of the sides of the batman picture cake. Write your message on the board.